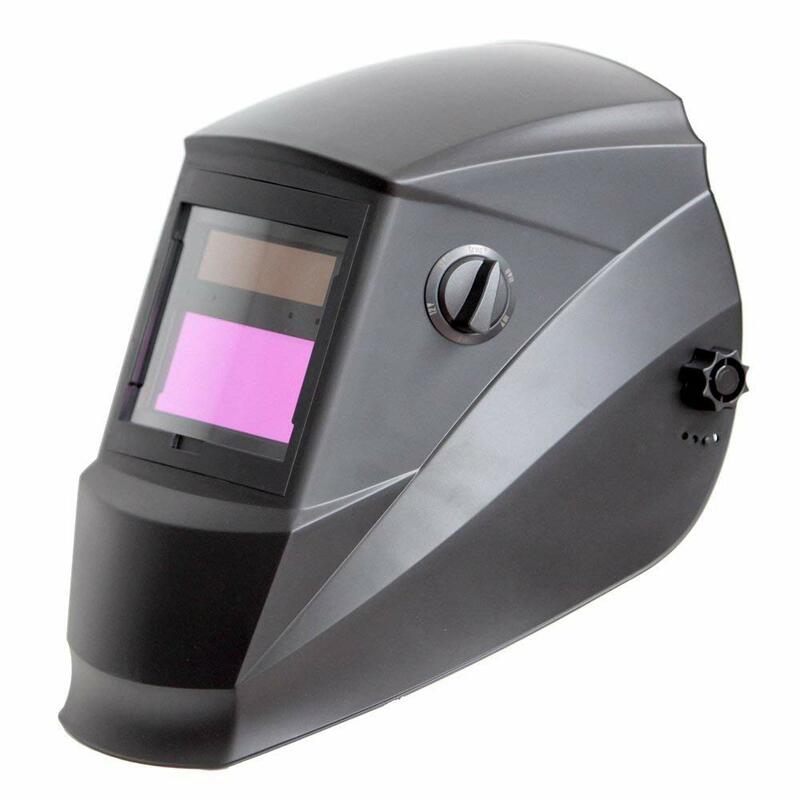 One undeniable fact is that auto-darkening welding helmets have become an integral part of welding and related practices such as cutting and grinding. The accessory does away with the traditional types of helmet that require you holding them or constantly adjusting the shade. Instead, they come with sensors that automatically adjust the shade as per the surroundings and light intensity. Moreover, they have sensitivity knobs that give you easier control of the accessory. While findings a helmet isn’t all that difficult, making certain it’s the best is much harder. The last thing you can imagine is the helmet feeling a bit too tight, too loose, not adjusting the shade appropriately, or working erratically. You also don’t want a piece that feels too heavy, have a small viewing angle, or make you sweat a lot due to the stuffy interior. In this review, we will walk you through the top auto-darkening helmets. They are suitable for different welding techniques (Mig, Tig, Mag, Arc/Stick), and also work fine when grinding or cutting. Without wasting too much time, let’s begin reviewing them. Safe welding is what this helmet by Jackson Safety seeks to achieve. It features a handy design for easy putting on and removal. It’s also lightweight and has a smooth interior for extra comfort. The hard plastic shell protects the user from abrasion, knocks, bangs, heat, flying sparks and more. And thanks to the auto-darkening lens, you don’t need to struggle with selecting the right visibility. 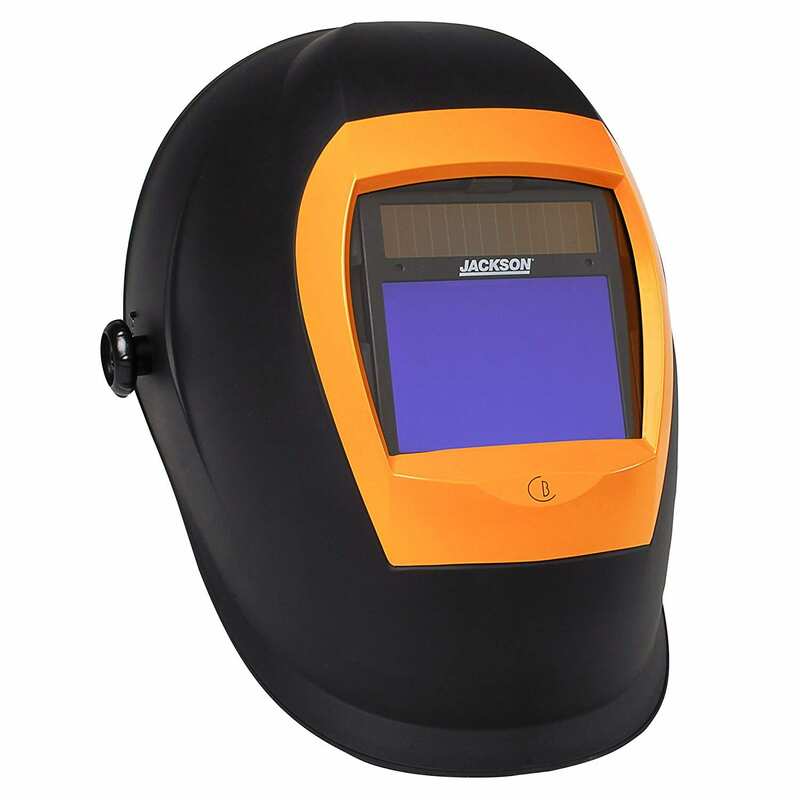 It offers variable shade (9-13) to suit different welding techniques including Stick, MIG, MAG, and TIG. The lens, apart from blocking too much brightness, also do a good job of stopping sparks, improving optical clarity, and providing the best light diffusion. For easy adjustment, the unit has user-friendly headgear. Welding doesn’t mean you exposing our eyes to bright light, flying sparks and other debris. You also shouldn’t inhale the toxic fumes that come with the process. With the Metal Man ATEC8735SGC helmet, you will be well protected from the bright light, flying sparks and debris, fumes, smoke, and other debris. This unit is made of a hard plastic shell and covers the entire head up to the neck region. The 4 built-in arc sensors allow the lens to change shade (9-13) depending on the environment and technique. It has 3.78 in. x 2.05-inch viewing area, which is not only practical but also effective. Wearing and removing the unit is easier, in comparison to other types. This is owing to the lightweight and versatile nature. It’s fit for MIG, Stick/Arc, TIG and other welding methods. 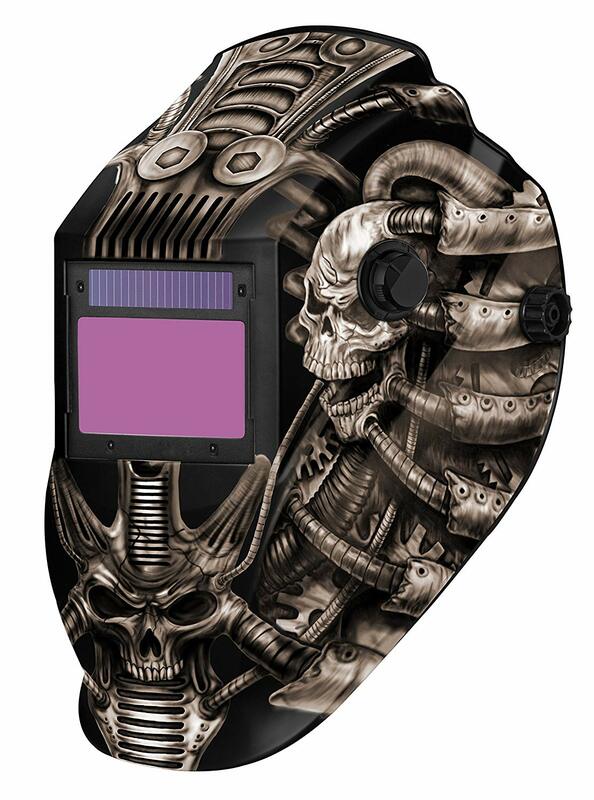 And to enhance its looks, it features a Techno Skull graphic. 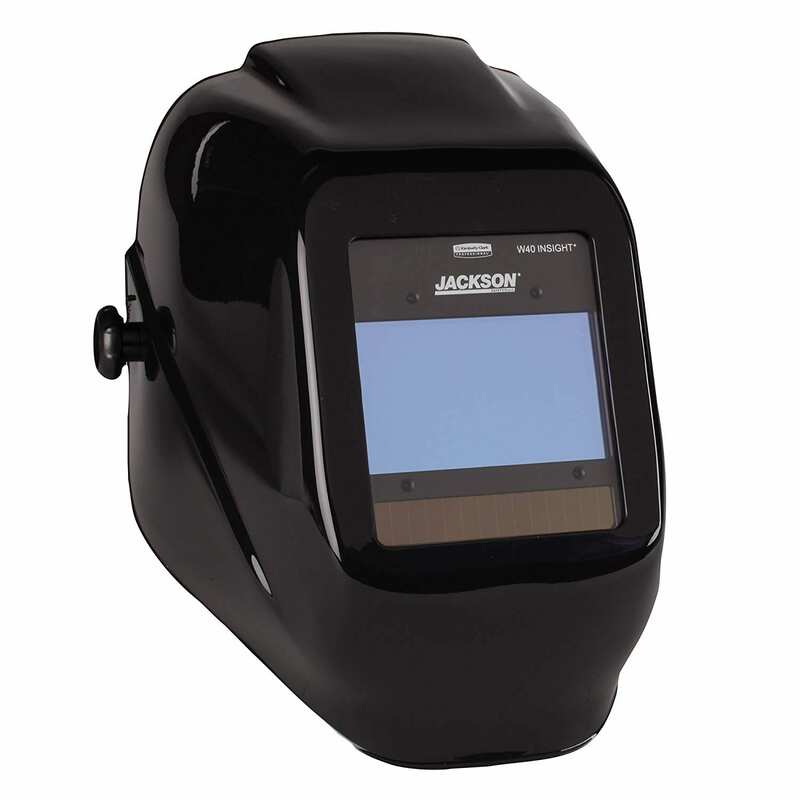 The Jackson Safety brand is known in regards to auto-darkening helmets for welding. The 46131 HaloX is among the notable choices from the company. It’s useful in MIG, TIG, MAG, and Stick welding techniques. The unit also provides nice visibility thanks to the 3.93 x 2.36-inch viewing area. And considering that you get 9-13 variable shades, you are more certain of good protection against bright light and flying sparks. The helmet is okay for men and women and is relatively lightweight. This together with the smooth and comfortable interior creates minimal discomfort during use. The 4 built-in sensors automatically adjust the shade to match the surrounding whereas the digital controls enable you to pick the best setting. The tough plastic shell and Len can put-up with the heat, bright light, fumes, bangs, impact and much more. Featuring 5 darkening shades (8-13), this welding helmet by 3M will ensure you weld in a safer and more effective manner. It may be lightweight, courtesy of the plastic construction, but provides effective protection against the sparks, heat, dust, fumes, abrasion, and knocks. The head accessory slides on/off the head easily and also has a smooth interior for comfort. In addition, it supports good breathability to keep the interior cool and prevents odor, stuffiness, and sweating. The extra large 9100XX auto-darkening filter is more effective and works faster than other types. This suits the accessory to different environments (tig, mag, arc/stick…) and also saves the wearer from having to regularly vary the shade. With proper care, this piece can last a long time. 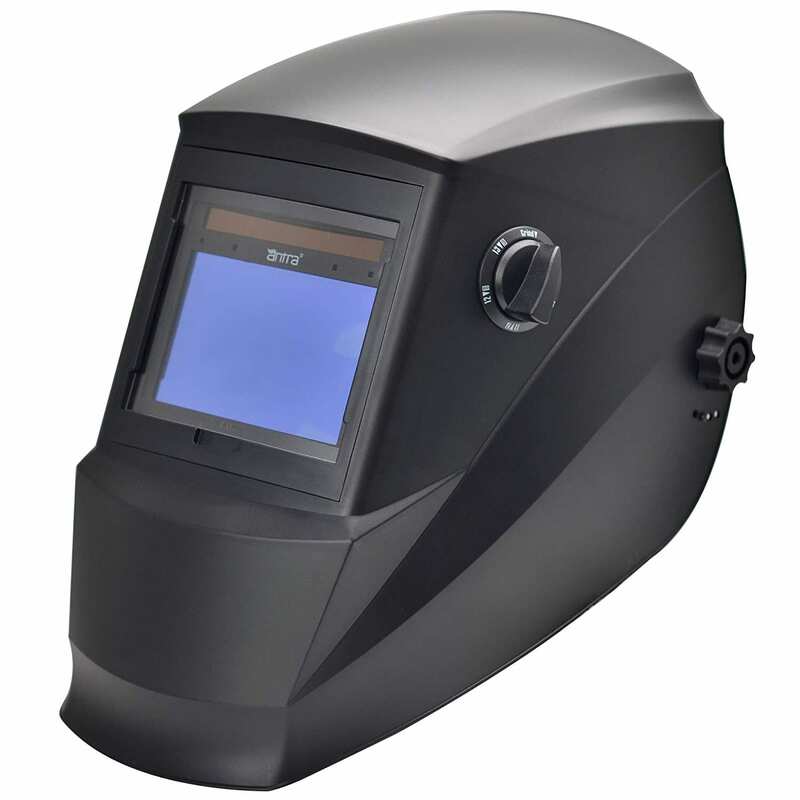 If you worry about depleting batteries too fast, then this solar powered welding helmet by Tanox is a worthy solution. It operates just like the other types but is more energy efficient. It comes with 4 shades of darkness (9-13) and is useful in welding (MIG, Tig, Mag, and Stick\k/Arc), Grinding, Cutting (Plasma, gas…) and many other activities. The unit transitions fairly fast thanks to the superior sensors and filters. It also features very sensitive knobs for utmost effectiveness. The item fully covers the face for maximum protection and has a smooth breathable interior for good comfort. The helmet is simple in design and fit for men and women. And as an added bonus, The Company throws in a pair of 16-inch heavy duty Kevlar gloves and a set of LENS cover and solar cells. With a wide shade range of 4/5-9/9-13, the Antra AH6 helmet is just what you need when working on metal. It boasts of a tough plastic shell that will stop flying sparks, metal pieces, fumes, and other things. 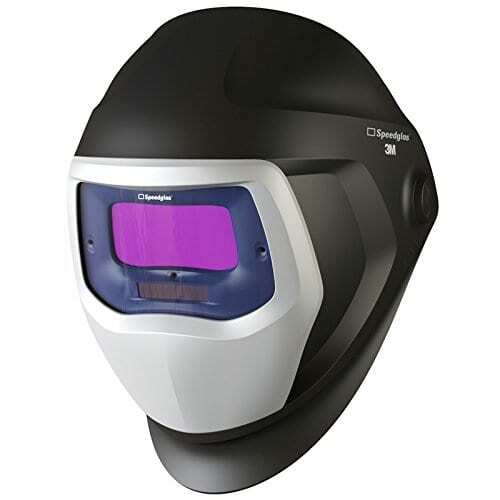 In addition, it features an auto darkening lens that reduces the brightness of the welding and grinding processes. This not only gives you better views for the perfect weld or cuts but also protects the eyes. It’s a good choice for Mag, Tig, Mag, and Arc as all as normal grinding, cutting and plasma cutting too. The sensitivity knob adjusts easily and conveniently whereas the Step-less Delay improves functionality. Like other leading welding helmet, this one is also lightweight but strong at the same time. It has a smooth and comfy interior and also inhibits excessive sweating/ stuffiness thanks to the good breathability. If you wish to weld, grind or cut metal and other materials safely and more effectively, then this welding helmet by Tacklife is worth acquiring. It has a tough PA shell to handle the environment, flying sparks, heat, and long wearing. It also features an auto-darkening lens that will adjust the intensity of the light it prevent eye damage. This unit is suitable for men and women and comes in an easy-to-wear / remove nature. It also feels light on the head and has good breathability for maximum comfort and to prevent odor. The widescreen offers better views than other options whereas the wide shade range (4-8/9-130 works well in the different environments. For a good fit and comfort, the head straps are easy to adjust whereas the special design allows for easy adjustment. Other than resistant to impact, the PA material will also combat the fire, corrosion, and rust. 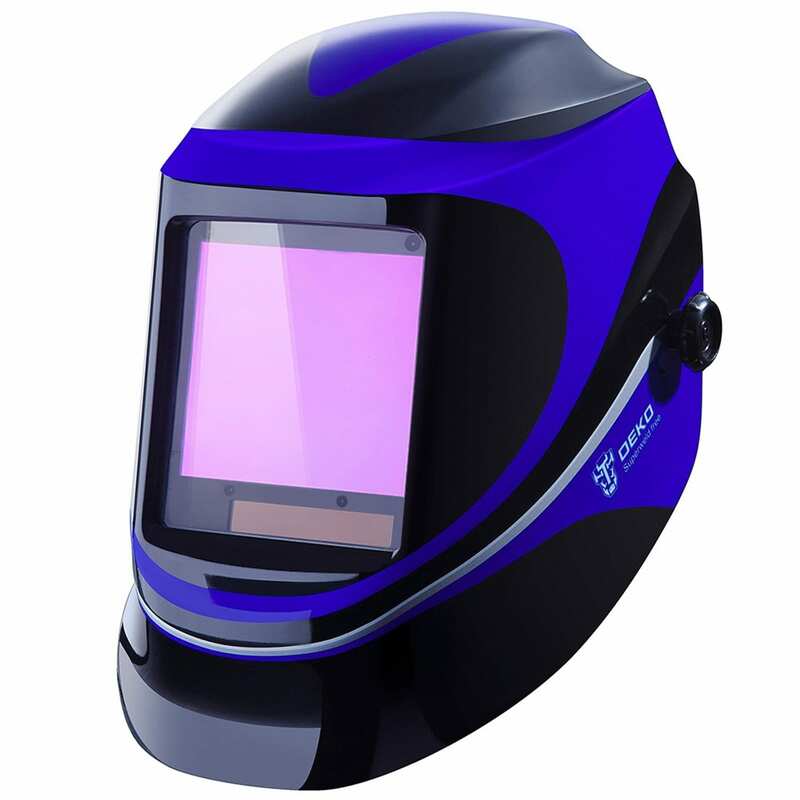 Welding, grinding, and cutting is much safer with this helmet by DEKOPRO. One thing that it’s well known for is the fairly wide lens which gives the user a better view. It also supports 4 shades ranging from 9 to 13. This makes it among the versatile and practical pieces in the market. The unit features a sturdy lens which is not only sensitive but also tough to endure the operations. The unit can be adorned when welding with Tig, Mg, Mag, and Arc, grinding and also cutting. It slides on the head easily and taking it off is equally easy. The credit goes to the lightweight, ergonomic design, and simplicity. Being a professional piece, it’s built of tough materials that are more tolerant to cracking, warping, and breaking. What’s more, it promotes good air circulation to make certain the wearer is comfortable and doesn’t sweat a lot. 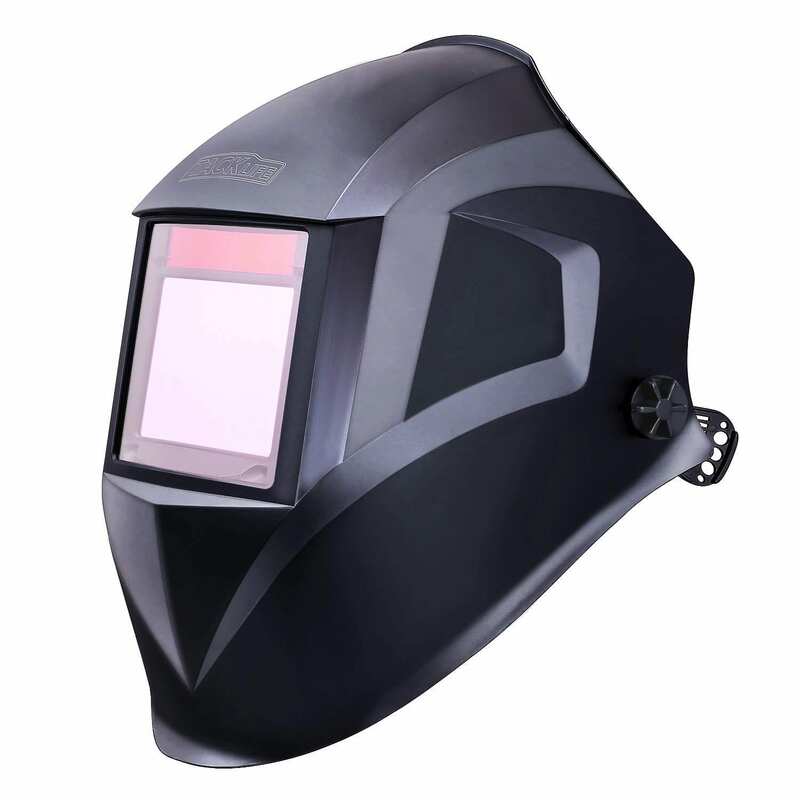 This black helmet is your solution to the harmful bright light, flying sparks, and fumes that are experienced when welding, cutting, or grinding metal. It has a practical size and easily fits on the heads of most users. And since its lightweight, the user won’t feel weighted down by extra weight. The head accessory is made of tough polycarbonate material which can endure falls, bangs, sparks, vibrations, and more. It has a smooth interior for comfort and good breathability to prevent odor, stuffiness and too much sweating. The auto darkening lens support shades from 5 to 13. They work automatically courtesy of the electromagnetic arc sensors and the switching takes place instantly. For easy control of the function, the item has sensitive ADF control modes whereas the Wide Screen View enhances the viewing. 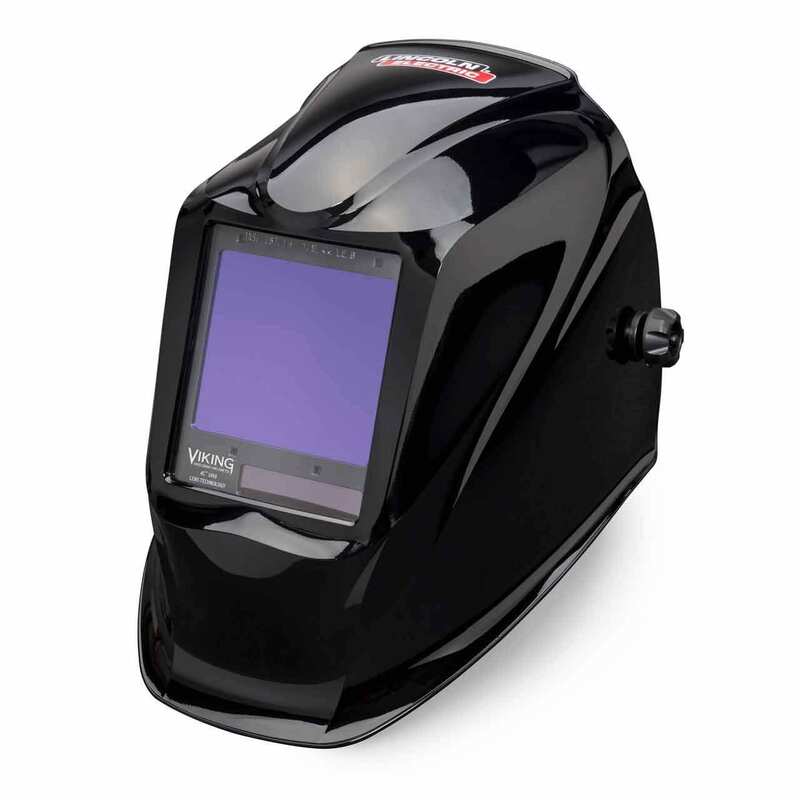 The Antra AH6-260-0000 helmet targets users who want the best safety and convenience while welding. It works with common techniques including Tig, Mag, and Arc/Stick. Additionally, the accessory is suitable for cutting and grinding. It comprises a tough plastic shell that protects the head and eyes from bright light, sparks and other debris. And since its solar powered, you won’t worry about replacing batteries or worrying about energy usage. There you have it the top 10 best auto darkening helmets for welding. To sum them up, it was essential to focus on the critical aspects. These include automatic/ instant shade darkening, easy wear/ removal, good quality, comfort, safety, reliability, durability, effectiveness, good ergonomics, and lightweight. The above pieces fared well in the main aspects and as you may see, they are backed by many positive opinions, comments, and reviews. Moreover, they get many 4-5 star ratings from satisfied consumers as well as reviewers. 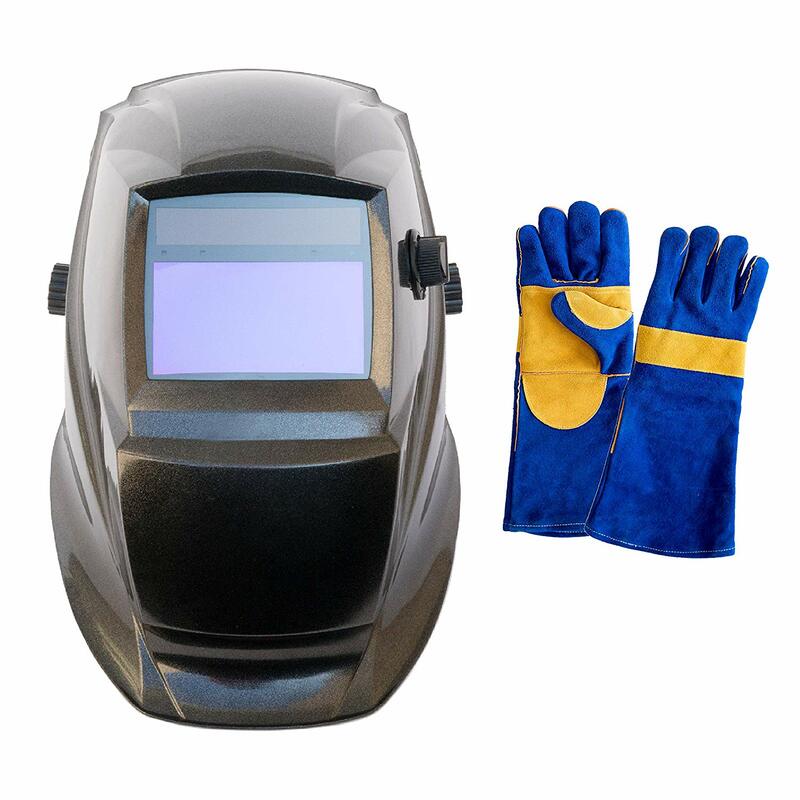 If you want to weld, grind, or cut in a more effective and safe manner, then you will find this review on the auto darkening welding helmet a good buying guide.